A weekly editor whose paper’s town centre office is closing this week has told readers it can do without one in future. 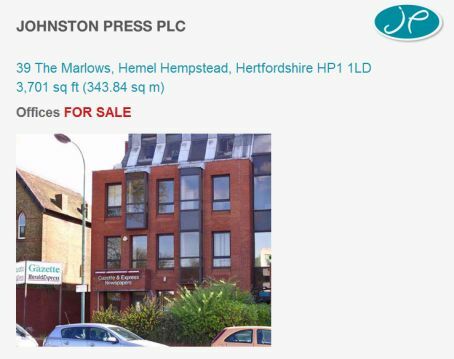 The Hemel Hempstead Gazette and its sister title the Herald Express are leaving their offices this week after they were put up for sale by owners Johnston Press. Editor John Francis has told readers that the paper will do without an HQ for the time being, saying it doesn’t need one. John said advances in technology now meant reporters and other staff no longer needed a physical office and would be armed with a “high-tech box of tricks” enabling them to operate from anywhere. The paper’s office in Marlowes are set to be redeveloped as part of a major project which will see it become home to Dacorum Borough Council staff. They had previously been put up for sale by JP for £350,000 as part of its nationwide property sell-off. Wrote John “Where will our new office be, you might ask. Well, for now at least we haven’t got one – because we just don’t need it. “Like many other organisations, we’ve realised that maintaining expensive town centre offices doesn’t make sense any more. “Our printers haven’t been anywhere near the town for decades, many other departments have been centralised in recent years because it’s more efficient, and for more than a year our advertising team has been spending the bulk of its time where it should be – with our customers, rather than sitting in an office. “That’s what we’re planning to do as well, because developments in technology over the past five years mean that we don’t need a physical office to stay close to the community we serve. “Each member of our editorial team has a high-tech box of tricks that allows them to file copy, take pictures or record video, update our website and even send pages to press from wherever they are. “You can get in touch with them wherever they are, too – they don’t need to be in a particular place to pick up the post any more. “Most of the time they’ll be working in Hemel Hempstead, of course, so we will be getting together – at locations like community centres, where we will be able to touch base with each other and be available to readers who want to drop in and tell us what’s going on. Ahead of the move, the Gazette also published the memories of a former employee at its print works, who said the office closure was “the end of an era”. John Newberry joined the Gazette and West Herts News in 1952 as an apprentice compositor and visited the papers’ base regularly, which was then a “Victorian monstrosity”, although the print works was based elsewhere in the town. He wrote: “Although the Gazette printing works was based at Bury Mill End at that time, my job did involve visits to the Gazette office in Marlowes to pick up copy from the journalists and adverts from the advertising department. “The office building at Warwick House, 39 Marlowes, Hemel Hempstead was one of those rather drab Victorian monstrosities which was, no doubt, originally a family home latterly converted into offices. “The company was jointly owned and managed by the Needham brothers, Douglas at the offices and Lionel at the printing works. “The editor at the time was a Mr Brown whose name was perfectly apt as he was of a brownish complexion due to his very heavy nicotine habit. John carried out a seven-year apprenticeship at the “Dickensian” print works and later became an applications specialist for an American company which produced computerised typesetting equipment. You had me up to the bit where you “touched base”, then I realised it was all management piffle. It’s very flattering to be the top item on HTFP, and be both alive and not heading off to some job in PR or training. What we are trying – and if it doesn’t work we will be looking for a new base in the town, but I think we’re well set – wouldn’t have been possible a couple of years ago, but now it makes perfect sense. Our staff have laptops and smartphones and they can get into the publishing system anywhere they can plug in, which I know is not possible for many other publishers. I’ve been working part remotely and part in the office for years, but now everyone in the team can do it. The potential of gmail as a tool is enormous and we have only just scratched the surface, but we have already set up a system of calendars, timed hangouts and video calls to add to our regular meetings on patch which are part of the weekly diary. And it certainly puts an end to the old reporter gripe that they just can’t get out of the office – now they have to plan ahead, fix meets with contacts and spend more time meeting and talking to people. To my mind what we are trying is far preferable to what has happened elsewhere, when offices have been closed and staff have been relocated miles away. We’re still where we should be, we just don’t have that familiar base. The most important thing is to make sure that nobody feels isolated. The only two downsides I have encountered so far are having to change our main phone numbers for exchange reasons, and not having anyone around who can be persuaded to make me a brew. Our meet-up sessions will be on a rolling programme taking in as many parts of the patch as possible – as a new town Hemel Hempstead has a clutch of welcoming community centres and lots of other key players in the town are keen to play host for obvious reasons. So I wouldn’t be banging my head on the desk, even if I had a desk to bang it on. It’s a change, certainly, but if you can’t cope with change and work out how to make it work for you then you shouldn’t be in this business. Here’s another link to that ‘coffice’ concept which might be illuminating. I’m sorry, I accept all the arguments about new technology, but an organisation with a business raison d’etre of communicating to a community – which is a physical thing – must have some sort of physical representation in the community it serves. The editorial staff shouldn’t be chained to their desks there all the time, but there should be a person who can deal with enquiries. Even most retailers, who beling to a very different species, accept that while online sales are the future, a physical presence must still be a part of the offering to the customer. As I said, new technology is offering wonderful flexibility to journalists and citizens alike to cover local issues, but John’s words sound to me like an attempt to compensate for the paper’s embarrassment. No more JP jobs lost, at least, just buildings. Personally, I would not feel part of a team or as motivated if I had to work remotely. Touching base on a “rolling programme” cannot make up for everyday office banter/motivation and new staff wouldn’t get to know their peers. I agree, this particular situation is better than staff being moved miles. Surely, in an ideal world, however, even JP would prefer their staff to have offices. It does make sense John. I’ve been in the game over 30 years, and sat in all kinds of Victorian properties during my career, without a window, or glass and metal monstrosities with windows I couldn’t open. I suspect in reality this will mean reporters spending most of their time working from home. This is fascinating and I really hope it works – for John, for his team and for the residents of Hemel Hempstead. John Francis – you’re welcome to it. You might be putting on a positive spin, but if what you’re practising is journalism, then thank the Lord I am no longer a journalist. Good on you John – you’re taking something foisted on you in the most positive way possible, and meeting it head-on. JP can talk all it likes about how this is a modern way of doing things, but as we all know, their primary concern is the bottom line. It’s impossible to envisage a situation where you guys tell the company this arrangement isn’t working, and then they get you a new office. Once the bill for running an office is off the balance sheet, it is unlikely to return. I think it’s the future for local journalists and who can say it’s a bad thing if they’re out and about where the action is in the community. It’s what’s happening on Facebook, Twitter and with the magazines springing up all over the place. Why should journos have to traipse in to some kind of ivory tower (well, hardly ivory in Hemel’s case as the office was pretty grim, apart from the tea making facilities)? This kind of move poses more problems for newsdesk managers if they’re stuck in old ways of working – but tough – they’ll have to shake themselves up and communicate in different ways. In the end it’s up to the journos to make the best of it, getting out and being seen, representing their paper/website. Who can object to that? The bit that never happens with this is the meetings in community centres. Traditional readers can’t be bothered to go out and overworked journalists won’t do the extra hours – so the quality and number of good exclusive stories brought to the paper by readers goes down. ‘Scoop’ thanks the Lord he/she is no longer a journalist. Based on his/her comments, so do I. It appears John is indeed making the most of what has been forced on him by JP, so good luck with it. But I do agree that, in reality, many reporters will end up working from home. JP would much rather its staff pay the energy bills, not them. I agree with Jess Unwin totally. Doom-mongers will always point out the possible pitfalls of any change. Have done and always will do. Speaking as someone affected by the move, it’s obvious that things will be different but we have to deal what’s in front of us and work with it. Anybody in this industry surely knows that big changes are imminent across the board in the next few years and it’s a case of moving with the times and working with what is asked of you. Especially in local journalism. I, for one, certainly won’t just sit around banging my head on my (mobile) desk. Scoop, Jess Unwin and Sub Mariner are quick to point out their objections, but how about a bit of support for people working through the changes? It doesn’t seem to have occurred to John Francis or his bosses, Johnston Press, that there are still many people, especially in the older generation, who don’t have either a computer or a Smartphone! No doubt they will be thought of as Luddites but the fact is that because they have chosen not to embrace new technology, or can’t afford to, they will be discriminated against and disadvantaged in not having any means of contacting their local paper. I have little doubt that John Francis is putting a brave face on it because he has no choice if he wants to go on earning a salary, however Johnston Press are notorious as a bunch of avaricious cowboys who have taken over a large slice of the UK’s local newspaper industry, including some very major regional ones, and slashed staffs, made journalists reapply for their own jobs and are generally interested only in saving money everywhere as a necessary adjunct to amassing large profits. There have been a number of strikes in various places against their policies. Having spent over 40 years in local and national newspapers, including 30 years in Fleet Street, I am, like another poster here, glad to be out of it! Once upon a time local papers had a real feeling for the communities they served. All that has gone out of the window because journalistic staffs have been pared to the bone, reporters no longer cover news in the way they used to and they are reduced to printing PR handouts and press releases from local councils, the NHS, police and big companies that may tell only half the truth or even propagate downright lies. Thus, there is no longer any independent investigative journalism in local papers and they have become little more than mouthpieces for biased parties who want to publicise their propaganda. I firmly believe there will be no printed local newspapers at all within 5-10 years because everything will be online and those who don’t have a computer will be discriminated against and disadvantaged, as I said. Brave new world? I think not, more an arrogant, harsh and uncaring world aimed at securing ever bigger profits for the big corporate organisations. It’ll be a huge shame for journalists not to have the buzz of a newsroom – and the advice from more experienced members of the team. However, that aside, if it means that some reporters will spend more time out of the office meeting real people and getting real stories…then it will be a positive result for the readers. Being a trainee in my first paid reporter job, I don’t remember the so-called golden age of journalism when newsrooms were filled with tens of reporters and a subbing team (a what?!?). Working remotely is something I’ve been used to since my student reporting days – editing in one poky basement room but going out and about to source stories and filing copy from home, at whichever hour suited me best, often taking our own photos and using social media. Things will probably feel different now I don’t have my fellow reporters sitting either side and in front of me, so I will be grabbing all opportunities to meet colleagues and the community face-to-face. After one year in the job I haven’t felt ‘chained to the desk’ as we are encouraged to go out, meet people and shoot video. As a team we have embraced this side of the job fully and have been used to it for months, so that bit won’t be changing. I do worry that I may become demotivated and will miss the office banter, but we are already managing to keep that up on Google Hangouts and have several scheduled meet-ups a week to touch base (sorry, Enough is Enough). So far the balance seems to be about right, and we’re only on day one. At the very least, the tea round is a much quicker affair. Strange that this is announced the same week that the JP internal newsletter told employees that Ashley Highfield and his team of top execs have found a new permanent home for the London office at Cavendish Square. JP never even used to have a London office until recently. As a young reporter I was never on the office. Sitting at a desk does not build contacts or find stories from real people anywhere near as well as getting out there. Good luck with this idea. I for one think its great! Having said that-I hope the staff get pay rises to cover their extra expenses! One of the best ways of learning the trade, and indeed any trade, is at the elbow of someone who has been doing it for decades. Under this system that doesn’t happen and the banter and pool of ideas you get in a newsroom is absent. It is a souless way of delivering news. The bonus of an office is the buzz you get as news of a story comes in and you all discuss ideas of how best to do the story. People come up with contacts, ideas and even how it could be laid out. If reporters and other staff are out on their patch constantly, how will this happen? Nothing beats sharing experience and ideas…this makes good journalists even better. There’s nothing wrong with reporters out and about but I think to get rid of offices completely is a big mistake. Why waste time with on-line news or papers. Go out, chat to people and get one’s own news! I’m sure it’ll only be slightly distorted by the time you hear it. I think that this is a really great idea and perhaps other local service providers could follow suit i.e The Police could all work from home or out of the back of their cars. Just think how popular that would be, we always wanted to get the Bobbies back on the beat. The Fire Department could save a fortune by shutting down their local depots and have firemen working from the comfort of their own engines, just waiting for an email or text from the chief fire officer, who is working from a shed in the bottom of his or her garden. The Bin Men could be roving around their areas in their rubbish carts waiting for the call to empty the bin at No 5 Sebastopol Terrace. As we know we won’t have a postal service anyway as Amazon announced before Christmas that they will be using ‘Drones’ to deliver the mail. New tecnology could be the answer to all our prayers, no more councils no more police no more red tape but unfortunately no more regional press. Day one in the virtual Hemel Hempstead office, and John takes time out to respond to some of the points raised. Sub mariner, Gladys and anyone else can drop their news in to a much more convenient address in the centre of town, thanks to the good offices of the local volunteer centre. JP Cost Cut Victim, banter has been going on all day through google hangouts, apparently these young people are quite used to socialising and communicating by text and the group function means we can all talk to each other all the time we are online. When new people join the team we’ll need to up face to face meets for copy clinics etc but that’s no problem. Jess Unwin, Archant titles in neighbouring towns do retain offices, but I don’t think (correct me if I’m wrong) that they have the level of technical trickery that our team has – remote access, laptop, smartphone, gmail and all that entails. Roy Stockdill: If there are people without computer or smartphone – though huge numbers of people of all ages do – they will be able to pop in and see us at our ‘roadshow’ get-togethers, and they certainly weren’t beating a path to our door at the wrong end of the main drag in the town centre. Sessions will be advertised online and in paper once we get into our stride. I’ve already got a long list of locations keen to play host, and fielded two more today. People want us to go to them, we are happy to oblige. I’ll happily put the Gazette of today up against the Gazette of 20 years ago in terms of breadth and depth of coverage, and take on anyone who reckons that what we offer now – including a seven day website, of course – isn’t streets ahead of what was on offer then, and still at a bargain price. Lots more competition for people’s time now, of course, but there’s the challenge. There will be printed papers in five, 10 or 50 years time if people keep buying them, and there’s another challenge. Thanks for the supportive comments from others, Homer has obviously been there and done that. And I can confirm that Afra Willmore as a young reporter was never in the office, and all the better for it. So JP is getting rid of its, mostly low rent, offices in the towns and cities it serves with its media and secured an office in one of the most expensive cities on the planet where it has no media representation whatsoever? Surely AH, especially with his digital credentials, and the rest of the JP senior team are fully wired into the world and don’t require old-fashioned desks, chairs phones, carpet, heating and lights. They are all so last week! Perhaps someone will pop in with an ad for a new butler? Is this some sort of Daily Mash spoof? If you have no office it will encourage others to muscle in on your circulation area and start a publication with their own office in town. There are plenty of business people out there awaiting the economic recovery who will jump at the chance to be mini newspaper barons. Then the public will forget you exist because you have no presence in town. The only people who can do without an office are the Post Office who are being reduced to delivering junk mail. Good luck to John and the team. The stream of negative comments just shows how determined many people in the industry are to see the downside of everything companies do. Whether JP has made the right decision or not remains to be seen, but at least this is an example of an editor embracing change wholeheartedly and doing all he can to make it work. That, at least, is something worth celebrating. So far our new virtual office is working brilliantly. It gives me the opportunity to demonstrate the talent I have developed during four years of working as a reporter. To make this work, I’ll have to manage my own time, prioritise my own workload and proactively engage the communities I’m working for. But that’s what I’ve been doing for years anyway. Training courses are so comprehensive these days that by the time reporters get their first job, they can hit the ground running. Working at home from day one should not be too much of a problem for today’s up-and-coming reporters, who are more talented and forward-thinking than ever before. I learned many of the multimedia skills I am using on a daily basis now years ago while studying a postgraduate journalism course at Cardiff University. By the end of today, I will have driven more than 50 miles to meet multiple contacts face-to-face to record video footage, take photos and gather news stories. We live in a multimedia age and the sooner people get used to it, the better. It’s hard to function as some sort of team if there’s no office to all work in! I assume you get money for your petrol? So, how far is so far, David? You take the company shilling and either toe the line or be a man. I don’t think it is helpful to criticise the obvious enthusiasm of individual journalists who are perhaps nearer the beginning of their career and more open to embracing the changes in the industry, or their seniors who are doing their best for their papers, readers and staff in challenging circumstances. All sorts of factors influence a decision to stick with a job or bail out and sometimes it takes more guts to stay than go. Let’s keep any criticism, or praise where due, for the policies and decisions of management, boards and senior executives. I hate to sound like a financially-pressed journalist, but no-one seems to have mentioned whether the enthusiastic and committed Gazette staff (what choice do they have but to make a good fist of it or look elsewhere) will be reimbursed for the relentless charging of their laptops and smartphones? I’m all for getting people out in the patch and would love a more central office but a newsroom is about more than four walls and a desk. And even as a Facebook and Twitter users I don’t see Google Hangouts realistically providing the same morale, banter and mutual support which makes a good news team tick. Best of luck to the staff but this smacks of cost-cutting and the bottom line winning over maintaining standards. Can we have some response please on any reimbursement of costs? Driving 50 miles a day and putting the kettle on are all well and good if you embrace the freedom, but factor in heating and internet connection and costs will soon spiral. Newsprint is dead, and you can tweet from anywhere, that’s all that’s needed, no body wants real news, 156 characters is enough, and that suits JP. Of course we get travel expenses. Subbed-up suggests we ‘either toe the line or be a man.’ Be a man how exactly? Journalists are all about communicating and being with people, so how can they be creative and give off their best if they are working alone and from where ever they find a bit of space – such as their kitchen table or a library. I worked as a journalist for 17 years, including for a time in Hertfordshire, and feel this is a very bad, and sad, move. I realise times are changing and newspapers need to adapt, but a newspaper still needs a heart and without an office and central point of contact, it won’t have one. The buzz of a newsroom is vital to a great paper. More than that, journalists come up with their best ideas when they are being creative together and bouncing ideas off each other. I fear the paper will only suffer. It strikes me that the devil is in the detail. I can’t see why remote working wouldn’t theoretically have advantages for journalists. It has the potential to get them out of their offices and into their communities. It also means there’s more chance of them being at the scene when a major incident breaks – or much sooner afterwards, at least. However, I have friends on a couple of titles where it was trialled and proved a disaster. This was not because the principle is flawed, but because it was executed poorly. Reporters were given ancient, refurbished second-hand laptops that creaked along at a snail’s pace and no 3G/4G connection – instead, they were told to find somewhere with free wi-fi and sit there as long as they can get away with it. Their promised mobile phones also never showed up, meaning they spent money on business calls they were never reimbursed for. I’m not saying the fundamental premise is flawed but, like so many of the industry’s efforts to engage with the modern working world, it won’t be successful if it’s done half-baked and on the cheap. I don’t think there’s any doubt that editorial teams can do just as good a job working in this way. In fact given that it encourages reporters to get out and about I would argue it’s a more effective way to work. Good on John, David and the team for embracing it and making the most of the situation. But offices are not just places for reporters to park their bottoms. It’s the older readers who still pop into offices to submit family announcements or free ads or just for a chat that will be left feeling alienated by office closures. These people do not want to phone a call centre in Sheffield or Scotland. They love the face-to-face interaction. Perception is everything and closing offices in small towns just further damages those papers, no matter how good their content. Thought I would check in after our first week just to see how the debate was going – 47 comments? I’m flattered. To the many observers who insist you can’t keep team spirit going, exchange ideas and have a laugh without an office I’d ask you to read some of what I have said before – we did think about these things, we did put practices into place to tackle them, and it is working. I’m afraid that those who insist that we have to pay for a town centre office building – and in recent years we’ve only had one in the main town we cover, we’ve had nothing in the other two or any of the villages – on the off chance that someone will come in with a BMD ad or a scoop, that’s not how the world works any more. Yes, people want to see people and you always get more out of someone face to face – but we have to go to them. But if the promised Daily Express whiteout/tornado/floods strike tomorrow and make your slog into the office a nightmare, have another think about us, up here in the clouds – and out and about on our patch! I know no-one likes to talk about money in these blue-sky thinking virtual times, but the question of costs doesn’t seem to have been addressed. Can someone from the Gazette confirm if staff can claim back the electricity/heating costs of working from home (which will surely be necessary at times), plus those of recharging laptops and phones and dare I say it making those vital cups of tea? Or are the reporters going to be subsidising their employers? If so, I can see many benefits of the plan in principle. Getting staff out in the patch more has got to be a good thing. On a side note: Mr Francis – where are your computer servers etc? Do you still have a facility to print out and check your pages before Press (or do you do this on screen)? Is it possible to have a confidential meeting about a controversial potential splash in a community centre or church – what about prying ears? Just re-read my previous comment. Obviously I mean I would prefer reporters not to be paying all their own costs. 50 comments later and still banging my head on the desk. In three months time, once the novelty has worn off, how many reporters will be viewing Jeremy Kyle and Cash in the Attic instead of being ‘out on patch’ meeting people? Rewrite a couple of press releases and your day is done in an hour. What’s not to like? To all of you who lived in the golden days and are disgusted by the new face of journalism – get used to it. Unless you want us all to carry on burying our heads in the sand and going out of existence in a couple of years because we have refused to move with the times? Any legitimate out of pocket expense can be claimed, as has always been the case. Where are our servers? All over the place, and of as little interest to me as where who provides the connection on my mobile phone is based, as long as the connection is there. Certainly our current cloud-based system seems a lot more robust than some I have worked with over the years. We haven’t used hard print for proofing for years, speed required for publishing online made it impractical. Old schoolers will say that there is a risk that more literals slip through, but that’s how we work. Confidential meetings – most of the locations which have invited us in have private rooms available by arrangement but for day to day we prefer a cafe setting as it is more informal. For sensitive interviews, we would go to them. My lot would never try to get away with that, but they know I would never let them. All about communication, you see. It’s great to see the comments posted from members of John Francis’ team, clearly relishing a new way of working and coming up with solutions to the challenges presented by not having a permanent office base. Given the editorial team all say that they feel more connected with the community and this way of working is neither damaging them or the quality of their work (quite the opposite, it appears), the only down side I can see is the absence of a calling place for customers wishing to place a BMD ad. Even that issue can be overcome – other publishers have successfully partnered with local newsagents to allow customers to book and pay for ads via their shops. This is a reply to many comments on many posts about JP over the last few weeks. It is honest and heartfelt. Former employees are (understandably) negative about this situation. JP is millions in debt but and is acting to repay that debt by making cuts… Unfortunately that is the only way. It’s pretty unfair to hurl out so many accusations without solutions. Editors who still love the business are rising to the challenge and doing as well as they can with what is available, and generally making a good job of it. Also, the drop in circulation figures cannot be blamed solely on JP or any other publisher. If the company had done nothing to embrace the Internet they would probably now be encountering an even graver financial situation. JP is millions in debt because too many people working for the company tell their bosses what they think they want them to hear rather than the truth.